With so many new movies coming out these days and so many fantastic places to eat in San Francisco it's amazing anyone finds time to do something other than one of those two things on a Friday night....yet somehow photography is still up there with one of the top three ways to spend a Friday night, and there's nobody more fun to photograph with than the Aperture Academy. 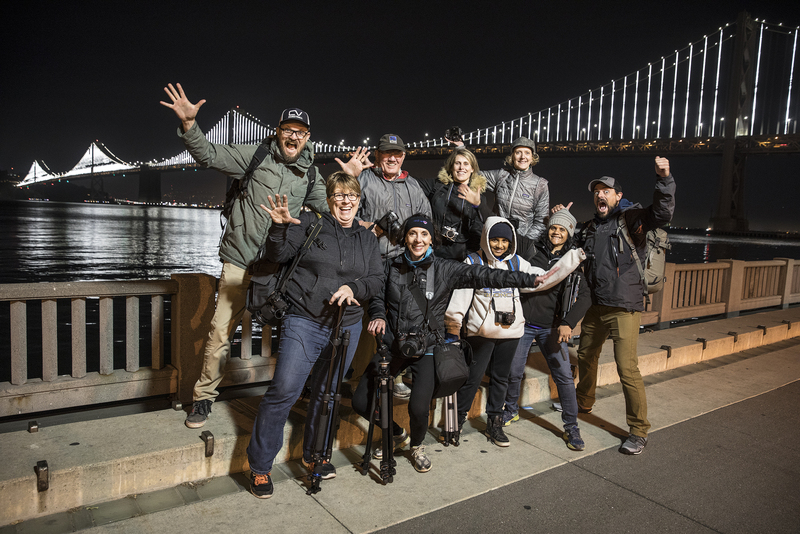 Scott and I met a group of 7 photographers for a fun evening of shooting in and around downtown San Francisco. 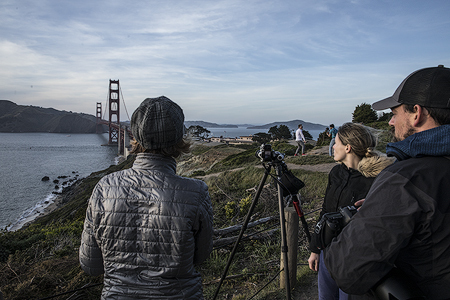 Our group of hearty photographers meets in Sausalito for a brief orientation before we set off to shoot. 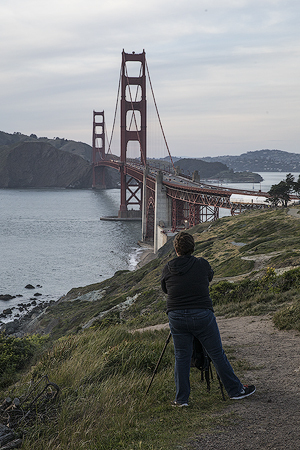 This time of year the sun doesn't go down until about 8pm, so we're able to go set up and shoot some sunset images of the Golden Gate before we really get into the night shooting. 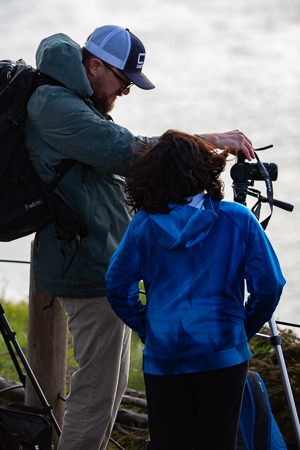 The wind was howling up on the cliffs around battery Godfrey. Our hearty bunch set up and Scott and I helped them with their settings, and getting the most out of this amazing vista. The sunset never really exploded with color the way we'd hoped, but there were pleasant bits of color throughout the sky, and everyone got some nice images to start off the night. 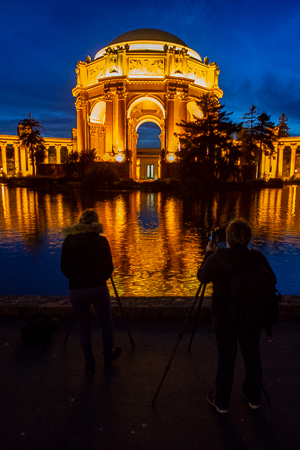 The next stop on the night was the Palace of Fine Arts...this is an awesome building that looks like it belongs in Greece or Rome...but here it sits right in the heart of the Marina District in San Francisco. We arrive at the height of blue hour, and that means we get the soft shades of blue in the sky mixed with the orange and gold of the architecture...then to make it better, we get the reflections of those wonderful color tones reflected in the pond that sits out front of the building...it's a stunning location for photography. 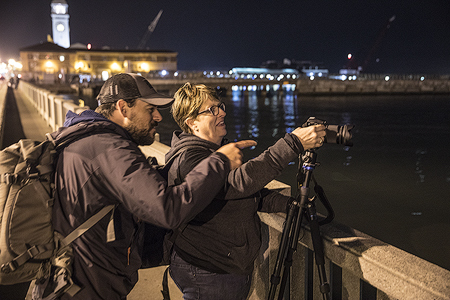 Our mission here is to get everyone comfortable with the settings, and then to kind of explain what happens to those settings as blue hour fades to the darkness of night. 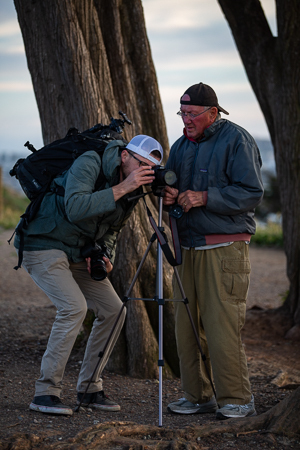 Though we don't have too long of this magical blue hour, we still get the group some nice images, and then a few more keepers as well as the last bit of blue fades from the sky. 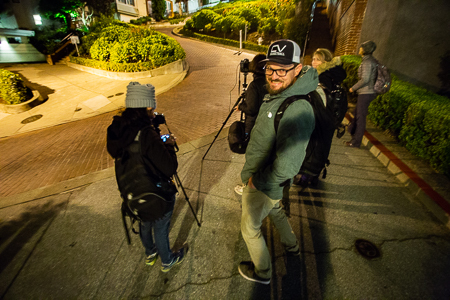 The next stop on the docket for the night is Lombard Street. 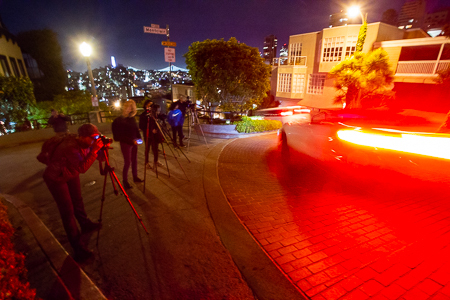 Here we get to shoot car lights as they travel down this crooked stretch of cobblestone. We move the group up and down the street so they can get headlights and taillights...this is an awesome shooting location because it's really where folks start to see images that don't look like your typical night images, this has a little bit different aesthetic to it with the streaks of lights painting different paths across the frame. 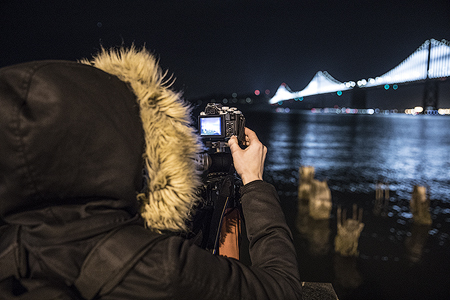 No photography expedition would be complete without a shot of the Bay Bridge, so it's off to the Embarcadero for some fun shooting this iconic bridge. We use some old posts left from a pier to help give our foregrounds something interesting. It's funny how something that someone probably considered an eye-sore can end up being the perfect compliment to making a great and iconic composition. By this point of the evening most everyone is getting comfortable with the settings, and now they can focus on trying to do different things with their compositions, and experimenting with changing their exposure lengths, white balances, and other fun things that come with a deeper understanding of the process. 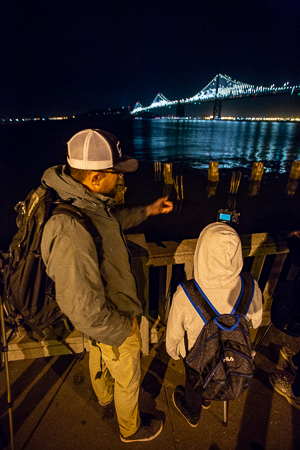 Though our time is coming to an end no trip to SF would be complete without a night shot of the Golden Gate Bridge...so we pack up, and set off for a stop at Fort Baker fishing pier, where we get a view of the bridge, that isn't one most of the tourists ever stop at. 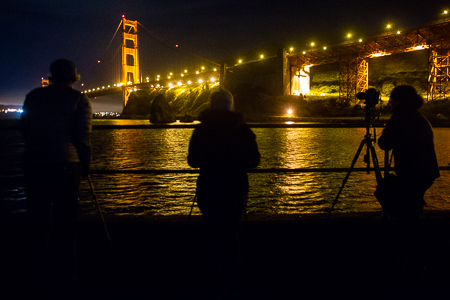 The wind is still whipping along the coast, so everyone is working hard to make sure they keep their gear upright...and though the wind is chilly everyone does a great job of making sure they capture a few last images of the bridge before we call it a night. 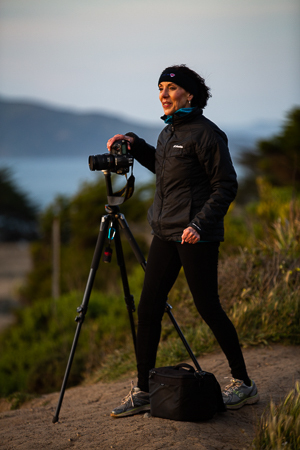 Who needs dinner and a movie when you're livinga real life adventure behind the camera.